One recent weekend I went down to Philadelphia to visit my daughter and her family. One day was spent watching my grandson’s Lacrosse game (my first ever) and having a boys night out at a Phillies baseball game with my son-in-law and both my east coast grandsons. The next day my daughter drove me up to Doylestown, Pennsylvania to visit the James A. Michener Art Museum. Yes, it is the author of all those best sellers such as, "Alaska", "Chesapeake" and "The Source". He made quite a fortune from his books and gave a great deal of it away. The museum, however, seems to have been the idea of the city fathers in honor of their favorite son who graduated from High School there in the 1920’s. 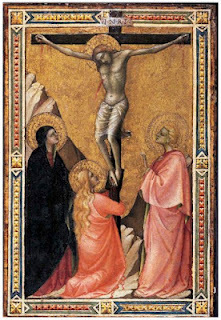 The reason for our visit was to see the above named exhibition, “Offering of the Angels” and the part of the title that I left out comes after a colon, “Paintings from the Uffizi”. We were recently at the Uffizi in Florence and that is the caliber of paintings I had hoped for. I guess that was wishful thinking. Obviously most of the pictures were from the museum’s reserves or as the Press Release would have it, “Secret Rooms” where the public does not go. Sandro Botticelli is extremely well represented in the Uffizi and they include some of the best such as “The Birth of Venus” and “Allegory of Spring” and many others. But the one they showed of a Madonna and Child bore a label that says, “Botticelli and a 19th century Restorer”… a first in my experience! 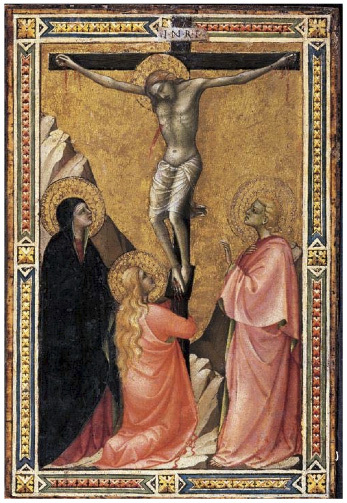 On the other hand, there are some wonderful paintings such as the Lorenzo Monaco (1370-1425) of Christ Crucified and the grieving virgin with Saint John and Mary Magdalene, on parchment laid down on wood. 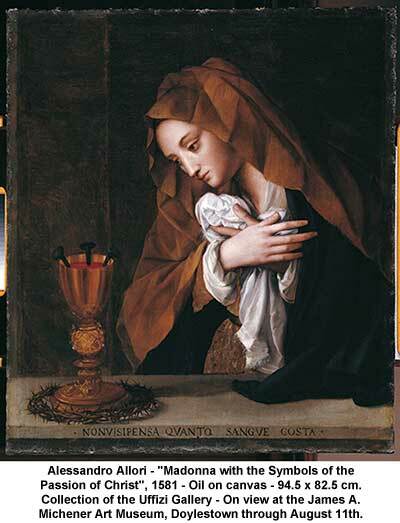 And the Alessandro Allori of the Grieving Madonna and Symbols of Christ’s Passion. The exhibition is broken into religious sections such as "Old Testament/New Testament", "Infancy of Jesus/ Madonna and Child", "Miracles and Passion of Jesus", "Lamentation, Resurrection and Epiphany", "The Eucharist". A better title than “Offering of the Angels” might have been, “Pathways through the New Testament”. I must say I felt for the curators both the one who had to go into the Uffizi’s reserves to find the paintings and the one on the other end who had to figure out how to put them together again. The Uffizi curator must have been torn by certainly not willing to part with their prize paintings but also by not being able to lend some of the great great religious pictures which would have been perfect for the subject matter but were on view in the main galleries. Years ago, an exhibition from a major museum abroad would go to the National Gallery in D.C. and/or the Metropolitan. Later on major museums in the largest cities such as LA, Chicago, Boston and Philadelphia would also get important exhibitions but it is a relatively recent phenomenon that museums in less central locations would get serious loans. I remember that when my wife, who was curator in Portland, Oregon, brought international exhibitions from the Hermitage in St. Petersburg or Brescia, Italy nobody in these locations had heard of the town but things change and today when foreign museums close for renovations they are happy to make a deal or just get more wide spread exposure as a tourist stop by lending to any responsible institution. The story goes that the Uffizi was sold on the concept of the Michener when they heard that the Museum was half way between Philadelphia and New York. Whatever the reason, it is nice that a regional museum can be exposed to the art of another culture.